There is a major shift going on in politics this election cycle, with more candidates and campaigns using social media and technology to boost their chances. 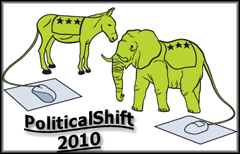 From today until the U.S. midterm elections on Nov. 2, MediaShift presents an in-depth special report, PoliticalShift 2010, with data visualizations, analysis, a 5Across video roundtable and live CoverItLive chat on Election Night with special guests. Stay tuned. If 2008 was the year that social networks like Facebook and Twitter broke through to mainstream America, then 2010 is shaping up to be the election year that’s defined by social media. 2010 will be the election year defined by social media. Three out of five Americans who consider themselves somewhat politically active are members of a social network; 70% of them expect to vote on election day. Consider that three out of five Americans who consider themselves somewhat politically active are members of a social network, and 70 percent of them expect to vote on Nov. 2, according to a recent study from the E-Voter Institute. Meanwhile, a report from the non-partisan HeadCount.org shows Republicans appear to be more engaged online than Democrats in this election cycle. Out of the current crop of Senate candidates, the Republicans have more than 1.4 million friends on Facebook and over 500,000 followers on Twitter. You can also track Facebook page stats by using the Facebook Page Leaderboard over at AllFacebook.com. The site also provides an interactive 2010 election guide made using Facebook stats. And you can find the top Twitter rankings and stats at Twitaholic. Democrats were early adopters of social media, user-generated content and blogging, but it appears that Republican supporters have caught up with, and in some ways surpassed, their rivals online. In seven of the eight races listed as toss-ups by the New York Times on Oct. 21, the Facebook fan gap has widened over the past month. Also worth watching are the difficult-to-poll three-way race in Alaska and the race in California, which was used by Nate Silver over at FiveThirtyEight as a case study on last-minute comebacks. Shields cited a Borrell Associates estimate that about $44 million would be spent on web ads but that would make up a miniscule fraction of total ad spending this year. 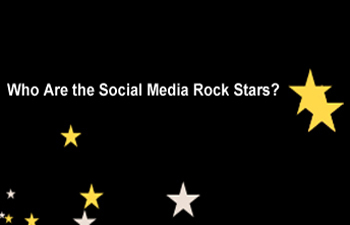 Who Are the Social Media Rock Stars? Use the interactive chart below to see how the most popular politicians and political parties measure up online. How do they compare to other widely followed sometimes controversial public figures? Who Is A Social Media Rockstar? to see how the Web is changing politics. Outside of the Senate candidates, the Republicans have several social media rock stars, while the Democrats have just one. Although @BarackObama has more online friends and followers than any American politician, several Democratic heavy-hitters are sitting on the sidelines while Republicans are revving up their political base. Vice President Joe Biden’s Twitter account went silent shortly before he was chosen by Obama as a running mate in August 2008. And while Hillary Clinton does not appear to have a working Facebook or Twitter account (outside of occasional quotes on the @StateDept Twitter feed), Sarah Palin tops 2 million fans on Facebook and @SarahPalinUSA has over 280,000 followers. Mitt Romney, the former Governor of Massachusetts, has more Facebook friends than Bill Clinton, the 42nd President of the United States. President Clinton’s Twitter account — assuming it is not a fake — is set to private and is punching way below its weight. Senator John McCain has two active Twitter accounts with a combined total over 1.73 million followers. They are TeamMcCain</a> for his Senate re-election campaign and <a href="http://twitter.com/senjohnmccain">SenJohnMcCain. 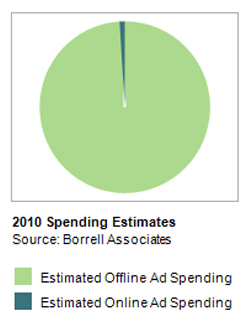 Borrell Associates — The company’s 2010 Political Advertising Outlook was widely cited in media reports. Correction Oct. 27: The original version of this post, and the related data visualization, incorrectly stated that Sarah Palin has over 5 million Facebook fans and more than 6 million Twitter followers. In fact she has over 2 million Facebook fans and more than 280,000 followers. Do you think that social media will play a large role in future elections? Does social media engagement translate into volunteer work, campaign contributions and voter turnout? Share your thoughts in the comments below. Anthony Calabrese is journalist based in Washington, D.C., who specializes in data visualization and digital storytelling. He works as a web producer for the State of the USA where he blogs about measuring the nation’s progress. Previously, he worked as a data researcher on the Best Colleges and Best Graduate Schools publications at U.S. News & World Report. He holds a master’s degree in interactive journalism from American University and is an active member of the Online News Association.